Information for users of U of I Box and the IT Pros who help them. Data security also involves ensuring any business data is always available to the business. Personnel changes, sickness, or other events can leave important files in your Box account unavailable to your colleagues, and they may not realize that until they really need it! 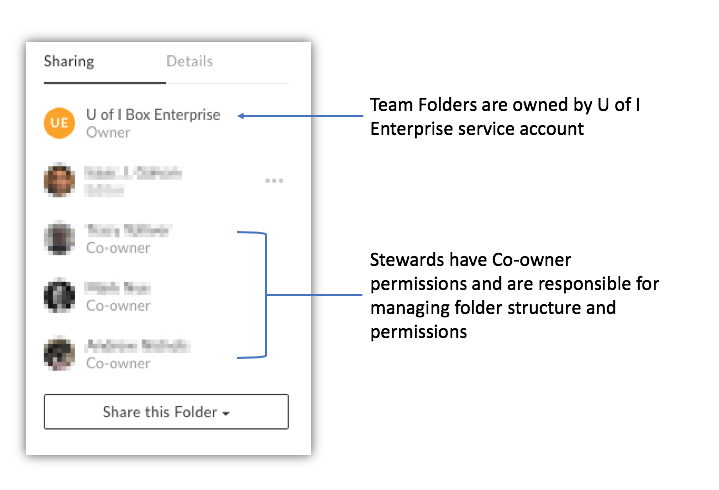 We've developed Box Team Folders to give teams and organizations a place to keep data that needs to be resilient to changes in unit personnel or project team members. Some college and departmental IT teams manage Team Folders for their users. Please contact your local IT team to find out more. See Technology Services KB: Information and Requesting Shared Team Folders for more information.